James Abbott McNeill Whistler (10 July 1834 – 17 July 1903) was an American-born, British-based painter and etcher. Finding a parallel between painting and music, Whistler entitled many of his paintings 'arrangements', 'harmonies', and 'nocturnes'. Why should not I call my works 'symphonies', 'arrangements', 'harmonies', and 'nocturnes'?.. .The vast majority of English folk cannot and will not consider a picture as a picture, apart from any story which it may be supposed to tell. My picture of 'Harmony in Grey and Gold' is an illustration of my meaning – as snow scene with a single black figure and lighted tavern. I care nothing for the past, present, or future of the black figure, placed there because the black was wanted at that spot. All that I know is that my combination of grey and gold is the basis of the picture, Now this is precisely what my friends cannot grasp. If the man who paints only the tree, or flower, or other surface he sees before him were an artist, the king of artists would be the photographer. It is for the artist to do something beyond this: in portrait painting to put on canvas something more than the face the model wears for that one day: to paint the man, in short, as well as his features; in arrangement of colours to treat a flower as his key, not as his model. This is now understood indifferently well – at least by dressmakers. In every costume you see attention is paid to the key-note of colour which runs through the composition, as the chant of the Anabaptists through the 'Prophète', or the Hugenots' hymn in the opera of that name. Shall the painter then.. ..decide upon painting? Shall he be the critic and sole authority? Aggressive as is this supposition, I fear that, in the length of time, his assertion alone has established what even the gentleman of the quill accept as the canons of art, and recognize as the masterpieces of work. Seurat's painting of the Grande Jatte proved extremely influential. May I therefore acknowledge the tender glow of health induced by reading, as I sat here in the morning sun, the flattering attention paid me by your gentleman of ready wreath and quick biography! Art is a goddess of dainty thought, reticent of habit, abjuring all obtrusiveness, purposing in no way to better others. She is, withal selfishly occupied with her own perfection only — having no desire to teach. Art is upon the Town! Listen! There was never an artistic period. There was never an art-loving nation. Nature contains the elements, in colour and form, of all pictures, as the keyboard contains the notes of all music. But the artist is born to pick, and choose, and group with science, these elements, that the result may be beautiful—as the musician gathers his notes, and forms his chords, until he bring forth from chaos glorious harmony. To say to the painter, that Nature is to be taken as she is, is to say to the player, that he may sit on the piano. That Nature is always right, is an assertion, artistically, as untrue, as it is one whose truth is universally taken for granted. Nature is very rarely right, to such an extent even, that it might almost be said that Nature is usually wrong: that is to say, the condition of things that shall bring about the perfection of harmony worthy a picture is rare, and not common at all. The rare few, who, early in life, have rid themselves of the friendship of the many. The masterpiece should appear as the flower to the painter—perfect in its bud as in its bloom - with no reason to explain it's presence - no mission to fulfill - a joy to the artist, a delusion to the philanthropist - a puzzle to the botanist - an accident of sentiment and alliteration to the literary man. It is for the artist.. ..in portrait painting to put on canvas something more than the face the model wears for that one day; to paint the man, in short, as well as his features. One cannot continually disappoint a Continent. I am not arguing with you — I am telling you. One is always finding out more. L.C. Ingleby, Oscar Wilde (1907). This is a paraphrased version of the quotation that has come to be accepted. For a chronology of sources see Quote Investigator. You shouldn't say it is not good. You should say you do not like it; and then, you know, you're perfectly safe. I say I can't thank you too much for the name 'Nocturne' as a title for my moonlights! You have no idea what an irritation it proves to the critics and consequent pleasure to me — besides it is really so charming and does so poetically say all that I want to say and no more than I wish. Whistler makes dry-points mostly, and sometimes regular etchings, but the suppleness you find in them, the pithiness and delicacy which charm you derive from the inking which is done by Whistler himself j no professional printer could substitute for him, for inking is an art in itself and completes the etched line. Now we would like to achieve suppleness before the printing. 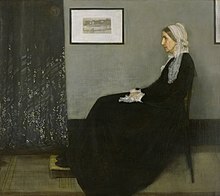 I saw two prints exhibited in Paris a year or two ago; they were rather delicate, meager and thin-looking, one would have to see a whole collection in order to judge them, for doubtless he [Whistler] has done some that are first rate. ..not merely for its clever satire and amusing jests.. ..but for the pure and perfect beauty of many of its passages.. ..for that he is indeed one of the very greatest masters of painting, in my opinion. And I may add that in this opinion Mr. Whistler himself entirely concurs. Whistler [at the Paris Impressionism-exhibition, of M. Petit, May 1887] has some very fine bits of sketches in paint, forty-two!! He was honored with the best places, he also has a large portrait of a lady, the painting is completely black. Nor is there any luminosity either. Whistler, by the way, does not care for luminosity. His little sketches show fine draftsmanship. In the corridor he has some very good, in fact, quite superior etchings, they are even luminous, which is strange for an artist who does not aim at this in his color. Quote of Charles Caffin (1906), as cited in James McNeill Whistler, Lisa N. Peters, Smithmark, New York, 1996, pg. 57; as quoted on Wikipedia. His landscapes of those years [mid-1860s] reveal that he had rejected his earlier commitment to transcribing nature in the manner of Courbet, and was responding instead to formalist imperatives, including flat, decorative surfaces, subtle tonal harmonies, and allusive, rather than literal, subjects. Taking a cue from a critic who had referred to his early portrait of his mistress, 'The White Girl' (1862; National Gallery of Art, Washington, D.C.), as a 'symphony in white,' Whistler began to envision and entitle his works with the abstract language of music, calling them symphonies, compositions, harmonies, nocturnes, arrangements, and so forth. This page was last edited on 24 December 2018, at 14:00.